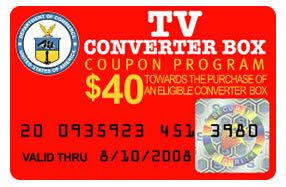 Remember back in August when I told you guys to sign up for the TV converter box coupon? As expected the government has run out of coupons. Rumor has it Obama is asking Congress to delay the switch in order to make sure everyone is prepared which is nice but I have a question. Did the government set aside $40 for each coupon issued or will they shell out $40 when each is redeemed? I requested a coupon where I lived over a year ago. If one shows up there no one will redeem it. I bet plenty of people requested coupons because they were following the "safe than sorry" adage but won't actually use them. Hopefully the coupons will have a reasonably short expiration date and people who don't use them can free up money for the next round of requestors. Also I've seen the boxes at Rite Aid and CVS. They're all $50 or $10 AFTER the coupon. Wasn't the point of the coupon that the government would be footing the bill for these things? It seems only fair since now you're paying to power a tv AND a convertor. "Wasn't the point of the coupon that the government would be footing the bill for these things? It seems only fair since now you're paying to power a tv AND a converter." That WAS the plan. But its a case of CYA on the retailer / producer end. Or just plain greediness. They either fear that the government won't be able to pony up the dough whether or not it was set aside to begin with (government is skilled in the way of accounting errors); or they figure people will have buy it any way and has got the customer by the proverbial antenna. I predict clearances in a few months when most of the people who bought boxes realize they don't need them. Imagine the garage sale rejects! *nod* That and when new TV start coming prebuilt with them warrants a "101 Uses for Your Old TV Converter" book.